Tomato season is coming to an end, a time which, for me, is bittersweet. I am at the same time sad that I'll have to wait another ten months for full-flavored, raw tomatoes to grace my plate, and pleased that this sign brings Autumn (and the cooler weather that comes with her) just a little bit closer. To remedy these mixed feelings, I've been making and canning lots and lots of sauce. The ritual of washing dozens and dozens (and dozens x10) of tomatoes, passing them through the Sauce Master (best. tool. ever. thanks Joe! ), and cooking the resulting puree down to half its original volume with onions, garlic, peppers, and herbs has been a weekly routine since mid-July. It brings me great pleasure to know that soon, when the air is brisk and the leaves have fallen, we'll be able to tap into a bit of Summer with one of the 30+ pints of marinara we've got stored away. 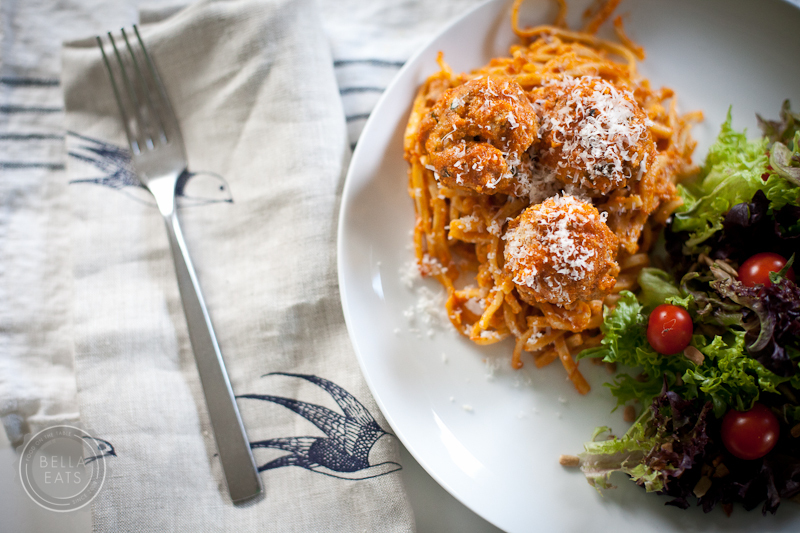 And, what better accompaniment to homemade tomato marinara than homemade meatballs? It had been awhile since the last time we made meatballs at home, but I'm thinking (and know that Brian agrees) that they should make a more regular appearance on our menu. They are so easy, and for us the epitome of comfort food when paired with fresh pasta and rich sauce. It may seem odd to have made a dish so warm and hearty during the heat of mid-August, but to me seemed an appropriate invitation for Autumn to hurry herself along. First, get the sauce going (it will take about 2 hours). Saute the bacon in a large, heavy-bottomed pan over high heat until starting to brown. Add the onion, garlic, and red pepper and saute for an additional 2 minutes, stirring pretty constantly. Add the tomatoes, crushing them with your hands as you put them into the pot, and scrape the brown bits off of the bottom of the pan. Bring the mixture to a boil, and reduce heat to a simmer. Let simmer for 1.5-2 hours, stirring occasionally. Immediately start the meatballs once sauce is simmering. Combine the breadcrumbs and milk in a small bowl, stirring until breadcrumbs are evenly moistened. Let stand for 10 minutes. Place beef and pork in a large bowl and break into small clumps. Add the parmesan, parsley, salt, and pepper. Whisk together the eggs and the garlic cloves in another small bowl. Pour over meat mixture. Using your hands, squeeze the excess milk from the breadcrumbs, reserving the milk. Add the breadcrumbs to the meat mixture. Using your hands, quickly and gently mix all ingredients together until everything is evenly distributed, taking care to not overmix. Chill at least 15 minutes and up to one hour. Moisten your hands with the excess milk, then roll the meat into golfball-size balls. You should have about 16 meatballs. Using an immersion blender or regular blender, puree the sauce to the desired consistency. Return to a wide, shallow saucepan and bring back to a simmer. Add the meatballs in a single layer, and continue to simmer for about 20 minutes, until meatballs are cooked through. You'll want to turn them about halfway through, but be careful not to break them apart before they are ready to move. Cook pasta and drain. Remove meatballs from sauce. Add pasta to sauce pan and toss to coat. Serve with meatballs and shredded parmesan cheese.